As I posted last month I've been nominated for the Glenfiddich Spirt of Scotland Awards in the Environment category for my work with the Save the Monadhliath Mountains campaign. This is a public vote and there's still time to support me, if you so wish. 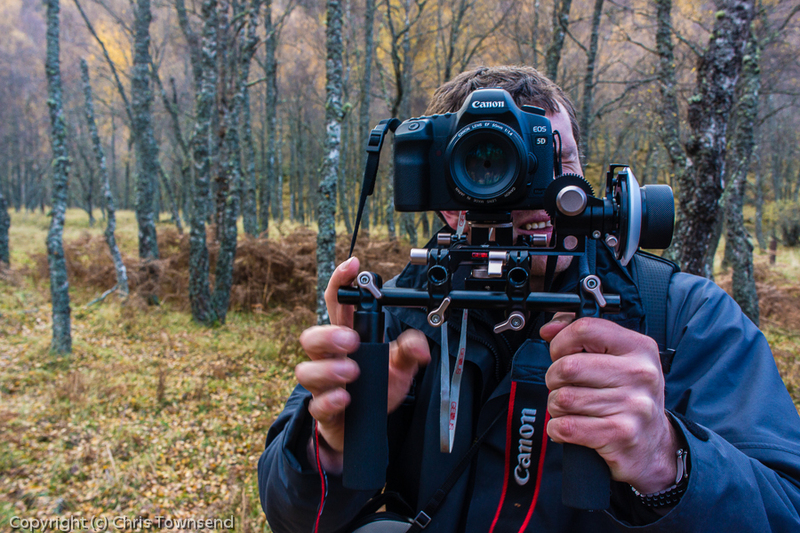 Today Ross, a video photographer, came up from Edinburgh to film me at work. The organisers had suggested that he should video me at my computer but that sounded dull and boring and anyway my office is rather disorganised (i.e. there's outdoor gear, books and magazines strewn everywhere). Instead I suggested we head for the outdoors as that is where I really do my work - the writing is just formalising it. I do actually think out much of what I write while walking as well of course as taking photographs. Outdoors video agreed we met in the Mountain Cafe in Aviemore (as I've mentioned before this wonderful cafe is a favourite meeting place -I'm happy to use any excuse for a visit!). 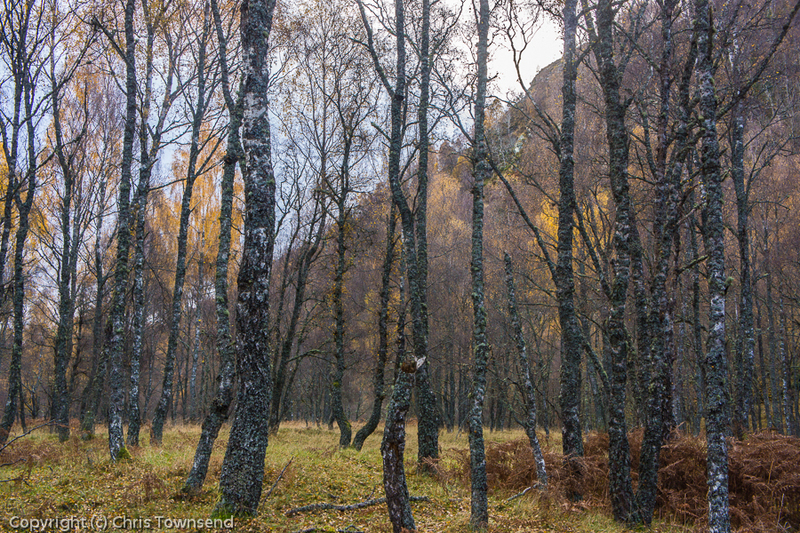 Then we headed up into Craigellachie Nature Reserve where the lovely birch woods are still showing the last of the autumn colours. 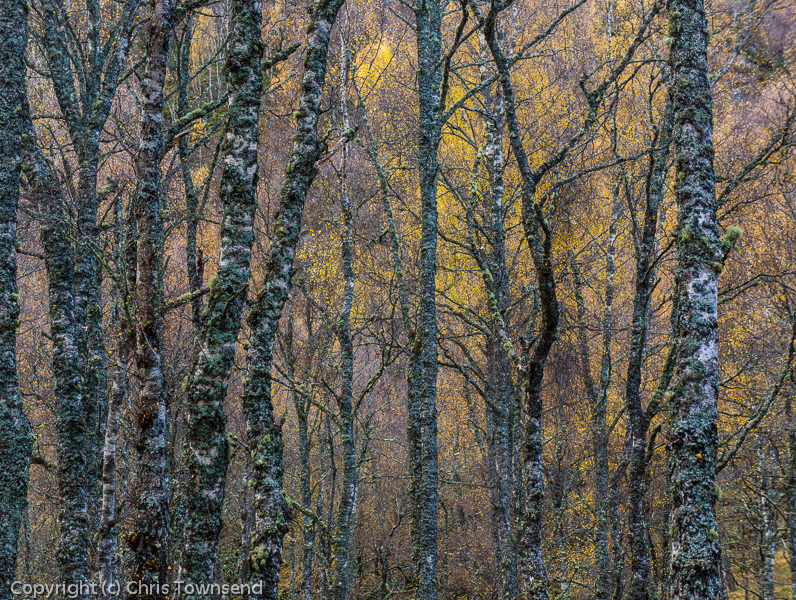 Here I wandered round being filmed walking and looking at the trees and the views. For a bit of variety we decided to film me taking photographs - which seemed relevant as I have visited the site of the proposed Allt Duine wind farm several times over the last year to take photographs and some of these were used as evidence in the Public Inquiry and have appeared in newspapers and magazines. Being filmed taking photographs felt rather odd and I needed to distract myself so I would look more natural. There was only way to do this. Take photographs! So I stopped pretending and started looking for compositions and adjusting the camera. That's when the photos shown here were taken. Then Ross took some close up video and asked me to point my lens straight at his camera, which was only about a foot away. Again I thought it best to take a real picture so above you can see Ross videoing me photographing him. Some of the things we do seem really strange!